“Cérémonie de rêve” by the Flovinno agency designs ceremonies for Weddings and Vow Renewals. We set up your ceremony in the Paris area, the French Riviera and in Normandy. Our agency “Noce de rêve” by Flovinno takes care of your wedding exclusively in the South of France and Monaco (beach, vineyard, villa…). The link to the Parisian wedding agency Flovinno accustomed to design ceremonies, and enabled “Cérémonie de rêve” to become expert in designing ceremonies in France, but also abroad ! The Flovinno agency designs unique events (weddings, baptisms…) in the Paris area, French Riviera and Normandy. With more than a hundred events coordinated, Flovinno acquired important abilities in wedding planning, events entertainment and decoration. We gather all of the main elements required to design the perfect ceremony for you ! Our team will help you to achieve your dream during this stressful period, and make your event a total success. 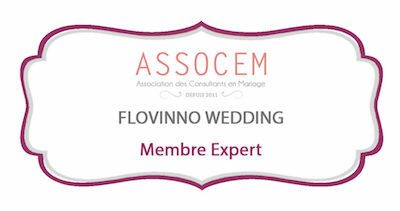 Flovinno is also member of the ASSOCEM (Association des Consultants en Mariage), which is the only French wedding consultants organism.